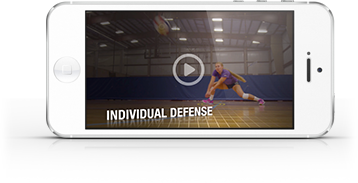 The 3-person drill you’ll see here, introduced by Coach ’Em Up founder Deborah Newkirk, teaches players that there’s a lot more to passing than just forming a good platform and directing the volleyball to the setter. Specifically, the drill trains players to focus on the proper movements they should make when their teammate is passing and to think about how their actions impact everybody else on the court. – Good drop steps by the non-passing players that allow them to keep their bodies facing the play in an athletic stance. – Shuffling together so the non-passers are close enough to the passer to make a play on a shanked ball. – Mental focus so players can quickly trade positions with the player next to them after each pass.